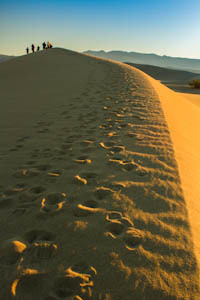 Death Valley National Park is a vast wilderness of extremes; in weather, temperature, altitudes and landscapes. 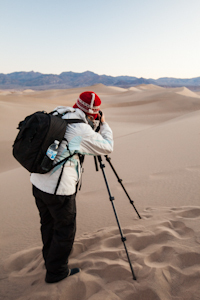 The park offers some of the more unique places to photograph, all in one place. 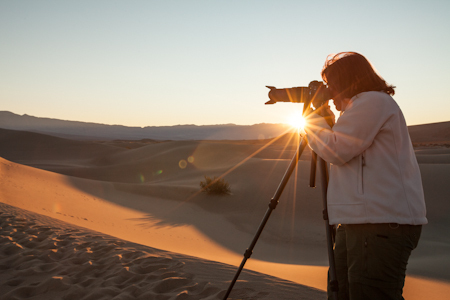 From sand dunes, to mysterious moving rocks, stunning salt formations, slot canyons, and extraordinarily colored vistas showcasing a vast array of minerals, Death Valley is a place of desolate beauty. How apropos then it is as a place for photographers to come and capture the beauty of such a wasteland. 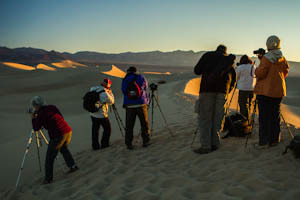 The Aperture Academy's Ellie Stone and Scott Donschikowski led a group of these adventurous photographers on a two-day hunt for some of the best images this place has to offer. 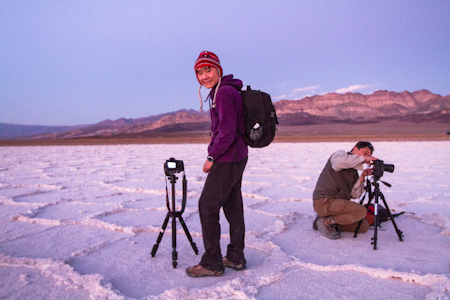 In Furnace Creek, the night before the workshop, the usual Aperture Academy orientation session commenced under a starlit sky. The group ran through brief introductions and Ellie and Scott explained what was to come of the workshop for the next few days. After a little wine and some laughter around the warm fire, it was time to ship everyone off to bed for an early start the next morning. Scott and Ellie drove the Aperture Academy van (otherwise know as the ApCab) to their morning meeting spot at the modest hour of 5:45 am. Despite the early start, the six students were brimming with excitement and anticipation for the day's photographic adventure. 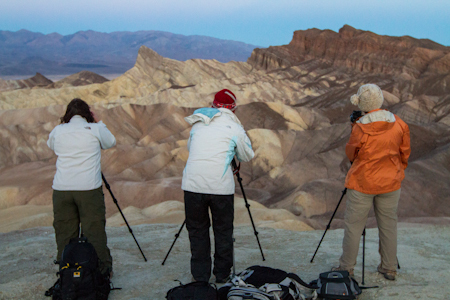 After a short drive, the group arrived at one of Death Valley's most famous locations, Zabriskie Point. 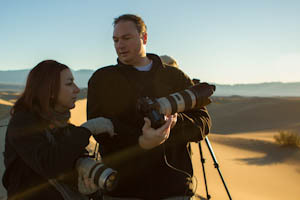 After a short hike up a paved trail, Scott and Ellie discussed the specifics of this amazing sunrise location. After only a few minutes, there was enough ambient light for the short decent on to a lower outcropping. 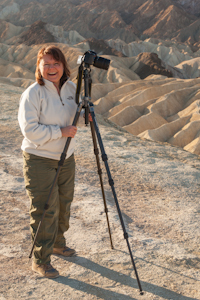 Just before the sun rose, the wildly eroded and vibrantly colored hills that encompass the Zabriskie Point area were revealed in the soft morning light. 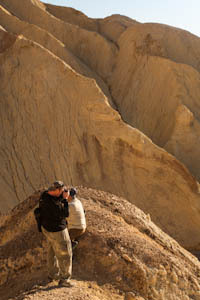 The morning's shooting location offered many different composition and vantage point options. 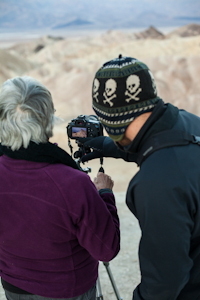 Ellie and Scott helped the students capture the stunning scenery, by discussing aperture and how to achieve the proper depth of field, ensuring the entire scene would be in focus. 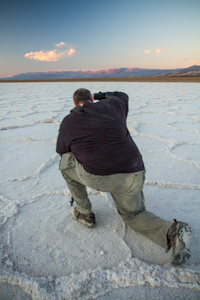 Off in the distance, the light began to bathe the Panamint mountain range in a pink glow. All were giddy with the beautiful display of light, and how it seemingly changed the landscape before their very eyes. Many compositional options were becoming evident, so Ellie and Scott spurred the students' creativity, by presenting them with various options to photograph. After the excitement of the first light had started to fade, attention was turned towards the fun of displaying a sense of scale. Off in the distance below, some photographers and hikers started to dot the landscape, and zooming in on and including the people below, it offered an astonishing demonstration of just how large the hills really are. Day one was officially underway in grand fashion, and it was time to move on to the next shooting location. 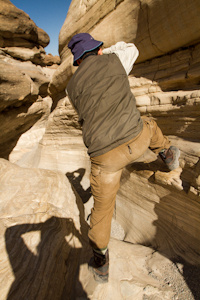 Just outside of Stove Pipe Wells lies a little gem called, Mosaic Canyon, which was stop number two on the day's itinerary. 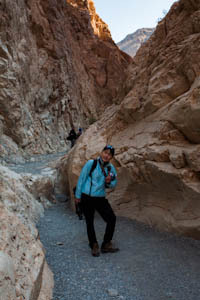 Shortly after the hiking path, the canyon narrows and makes way to some unusual and marvelous rock walls. A mixture of marble and angular blocks of dolomite, along with a pebbly matrix, make up these steep canyon walls. In a valley so immense, this is just one display of the smaller details among a vast landscape, which beckon to be photographed. 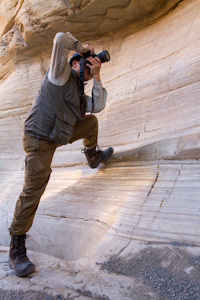 After twisting and climbing their way up the canyon, Scott and Ellie demonstrated how to capture this unique and challenging location. 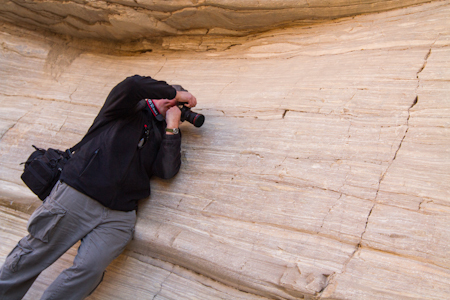 For those who have never photographed such areas, the task can seem a little intimidating. Usually, pupils only need a little guidance on changing their point of view and "seeing" ordinary things in new ways. 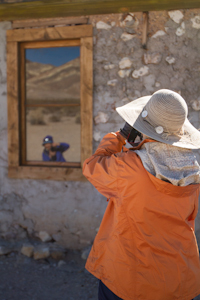 Once the creative juices started flowing, there was no stopping it, and the sound of shutters filled the canyon. 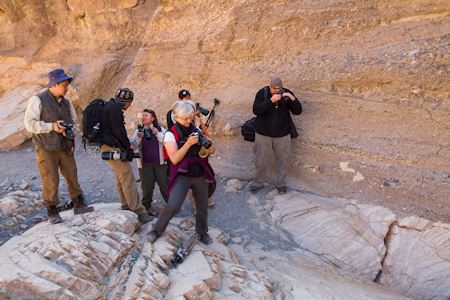 The group made their way back through the canyon, all the while capturing the countless winding "S" curves, as well as the intimate details of the native plants, which precariously grow along the rock walls. The desire for fresh brewed coffee and a hot meal was on everyone's mind, so good thing it was time for a break. 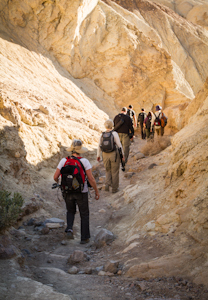 After the midday break, everyone was raring to go for another beautiful canyon hike. This time, the location would be Golden Canyon. 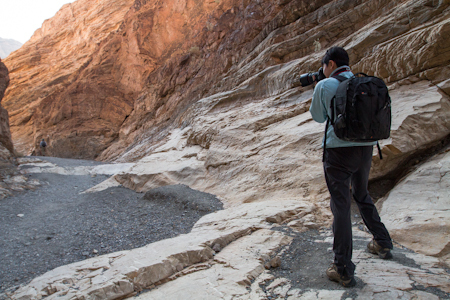 It's about a mile hike into the Canyon to an immense rock formation known as, Red Cathedral. The oxidation of iron creates an amazing red color, which becomes even more stunning against the soft yellow mudstone below it. 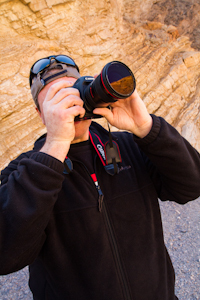 Wide-angle lenses were used to capture this up close and personal view of the red rock giant. Golden Canyon was amazing, but it was time to start heading back, and the entire group looked forward to the sunset location in Badwater Basin. 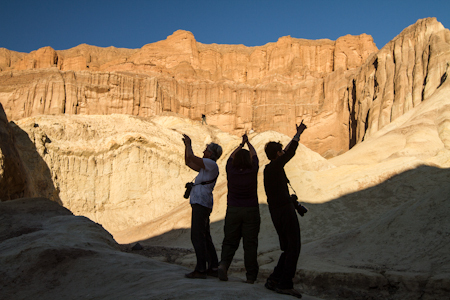 During the journey back through, it was easy to see why they dubbed the location "Golden Canyon." The walls seemed to radiate a warm golden hue. Hard to leave such a stunning location, but sunset on the salt basin beckoned. 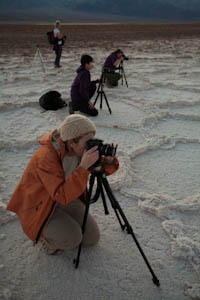 As the group approached the salt pan, and one of Ellie and Scott's favorite locations, it seemed as though some other photographers also fancied this out of the way setting. It was fun to learn that the others already there were actually photographing for Vogue magazine. 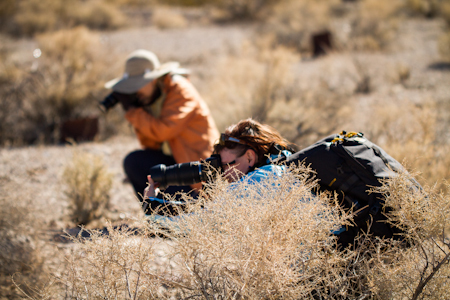 We all felt pretty cool about shooting in the same area as a major publication. 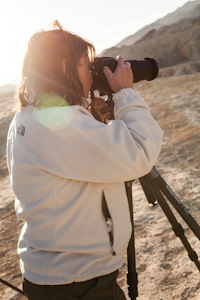 Luckily the magazine group was on the opposite side of the road and never interfered with our beautiful sunset images. 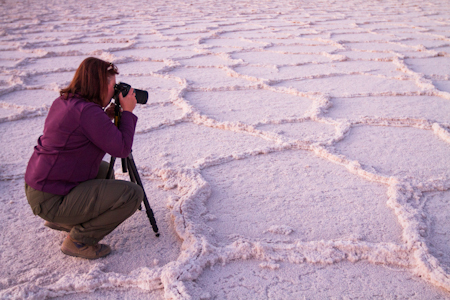 Besides the setting sun, the main focal points within the salt are the formations known as polygons. 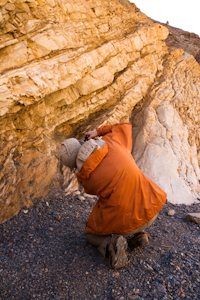 Ridges are formed in the salt, from the process of heating and cooling. 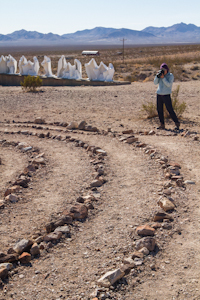 What nature leaves behind are spectacular shapes, which embody the entire playa. These shapes make for an interesting and compelling foreground. Scott and Ellie worked with the students on setting up the best composition and manual exposure settings, to ensure a sharp image throughout. 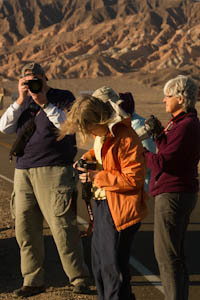 As the last of the warm light gave way to dark blue skies, the group made its way back to the ApCab for the short ride back to Furnace Creek, and the closure of an amazing first day. 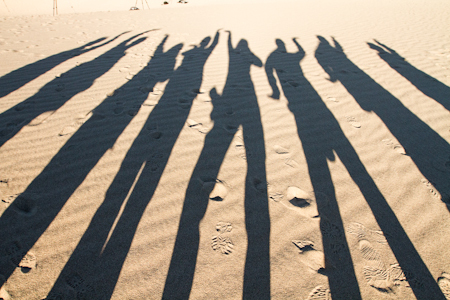 Even though it was another early start, the anxious group of photography students arrived right on time, 5:30 am. Another incredible day was on tap. 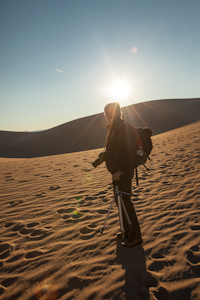 After loading students and gear into the ApCab, Scott drove them all out to an amazing Death Valley location, the Mesquite Sand Dunes. 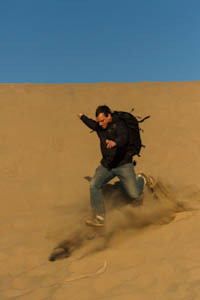 The dunes vary in size, and reach up to 150 feet. 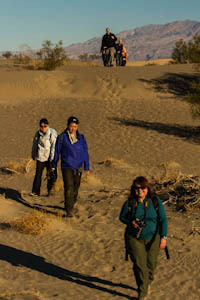 Scott and Ellie led the group out into the vast and magnificent landscape. 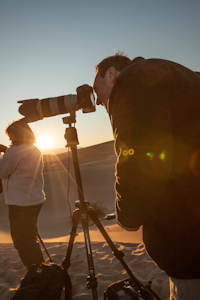 The dunes are an excellent location to work on compositional basics, such as line, texture and shape. 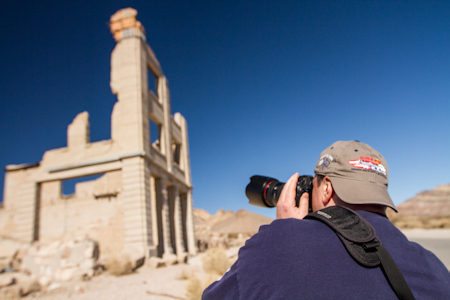 From the Mesquite Sand Dunes, near the eastern edge of Death Valley, about 120 miles northwest of Las Vegas, there is a ghost town in Nye County, called Rhyolite. The town began in early 1905 as one of several mining camps that sprang up after a prospecting discovery in the surrounding hills. During an ensuing gold rush, thousands of gold-seekers, developers, miners, and service providers flocked to the Bullfrog Mining District. Many settled in Rhyolite, which lay in a sheltered desert basin near the region's biggest producer, the Montgomery Shoshone Mine. 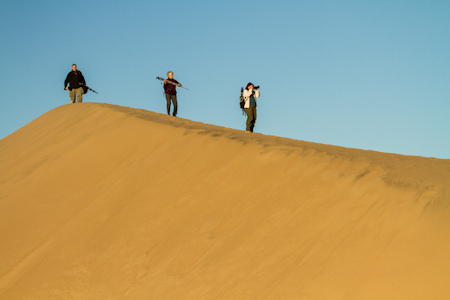 Shooting a location like this can be exciting... and intimidating. Some are not sure where to begin. Ellie and Scott where on hand to help the students tap into their creative side and get started right. 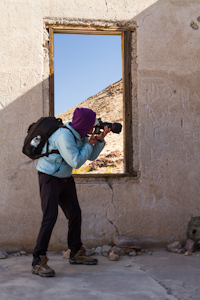 When approaching unfamiliar territories, it can help to think of your photographs as a photo essay. Tell the story of an area with photos. 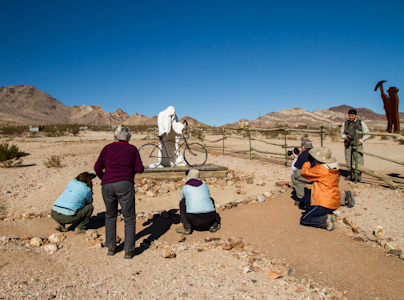 The wind was whipping and the temperature was a little low, but the morale was high and all hands were motivated to tell the Rhyolite story in imagery. 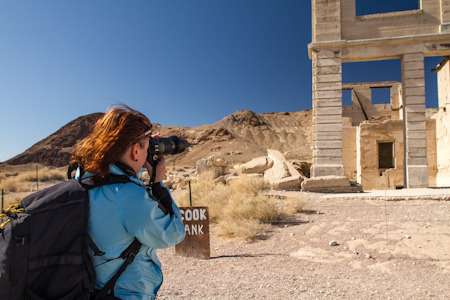 Once the group concluded their time in the ghost town, Scott and Ellie took them to a funky little area just a short distance from the relics of Rhyolite. Imagine seeing a beautiful mosaic couch sitting in the middle of the desert - along with some plaster ghost figures. These are the types of thing you'll find at Goldwater. Those passing by, surely think it's the weirdest thing to stumble upon. Photographically it's both fun and interesting. 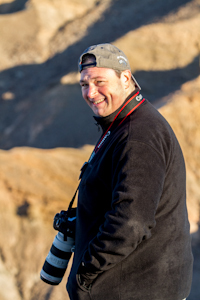 Using wide-angle lenses and extreme points of view makes for some compelling images. After playing around in Goldwater, it was time for a lunch break in the town of Beatty, NV. It was hard to imagine that the weekend's journey was almost over. Just one more stop, for sunset, was on the agenda. 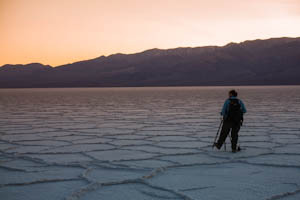 Badwater is so amazing, and ever changing, you could photograph the location many times, and still obtain different images. 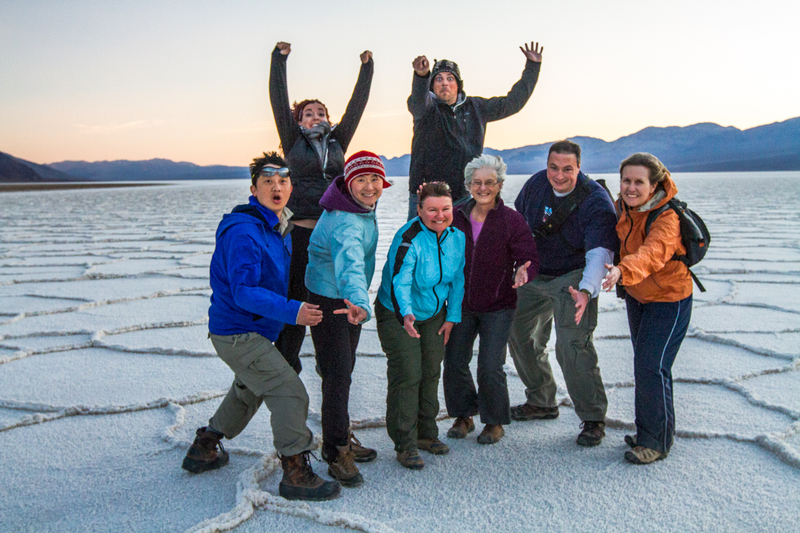 Ellie and Scott took the group to another fantastic location within the Badwater Basin. After a hike out over some undulating dirt formations, the polygons did not disappoint. There seemed to be countless polygons at this location, and all had astonishing shape and texture. The students had really started to get the hang of all the necessary skills to capture this gorgeous display in their own cameras. 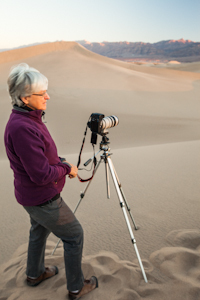 As the last bit of warm light faded, it was time to head back to Furnace Creek for the last time on this outing. Another fantastic and productive workshop had come to a close. 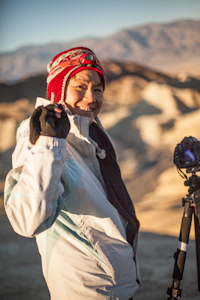 Sincere thanks from Scott, Ellie, and the entire Aperture Academy team.